Sunday’s “Our Future, Our Right” March with MN Youth for a Fossil Free Future. The march and rally ended in the Minnesota Capitol rotunda. Youth around the world will feel the greatest impacts of climate change. So it makes sense that youth are taking a lead to force the government and business interests to stop thinking about short-term profits and two-year election cycles and start thinking long-term about the planet’s very survival. Youth are taking the federal government to court to force stronger action against climate change. They are taking the Minnesota Public Utilities Commission to court to stop the Enbridge Line 3 crude oil pipeline. They are petitioning the Minnesota Pollution Control Agency to write stronger regulations to reduce greenhouse gas emissions. They are getting ready for the 2019 legislative session. 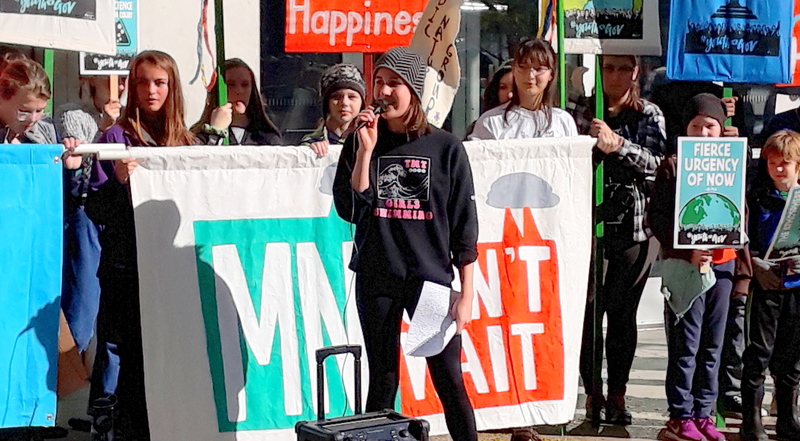 To bring attention to their work, youth-led groups organized a climate justice rally and march on Sunday called “Our Future, Our Right.” Several hundred people gathered at the U.S. Federal Courthouse in Downtown St. Paul to show their solidarity with the youth leaders, then marched with them to the state Capitol. At the national level, a group of 21 youth is suing the government to take stronger action to stop climate change in a case called Juliana v. the United States. 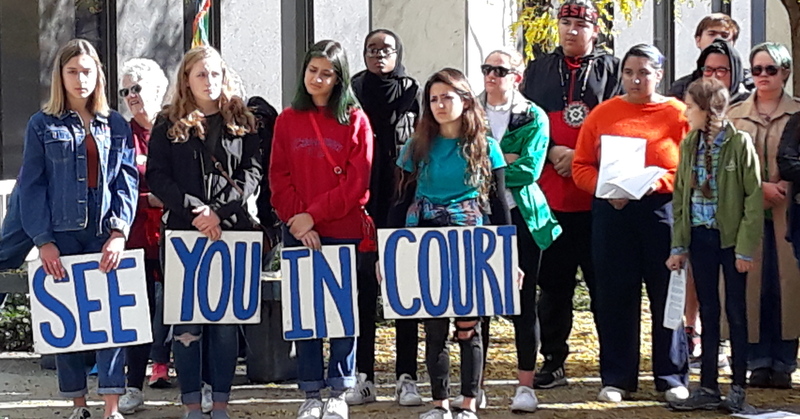 Minnesota youth chose to hold their rally and march on Sunday, Oct. 28, because it was the day before the federal case was supposed to go to trial in Oregon. Why the government appears so frantic to avoid the trial has been an overriding, and unanswered, question. But part of the reason could be that the case puts the government in an uncomfortable legal position. Much of the evidence used by the young people to prove they are being harmed by climate change comes from the government itself. At the state level, the Youth Climate Intervenors have worked tirelessly to stop the Enbridge Line 3 crude oil pipeline through northern Minnesota, a project state experts say would add $287 billion in climate damage over the next 30 years. The Minnesota Public Utilities Commission (PUC), the body reviewing the project, disregarded the climate science and voted to approve Line 3, pending negotiations on final details. Sophia Manolis, one of the Youth Climate Intervenors. The Youth Climate Intervenors and others have asked the PUC to reconsider its vote. While the PUC is unlikely to change its mind. The next step would be to sue in court to overturn the PUC’s decision, a significant and costly undertaking. 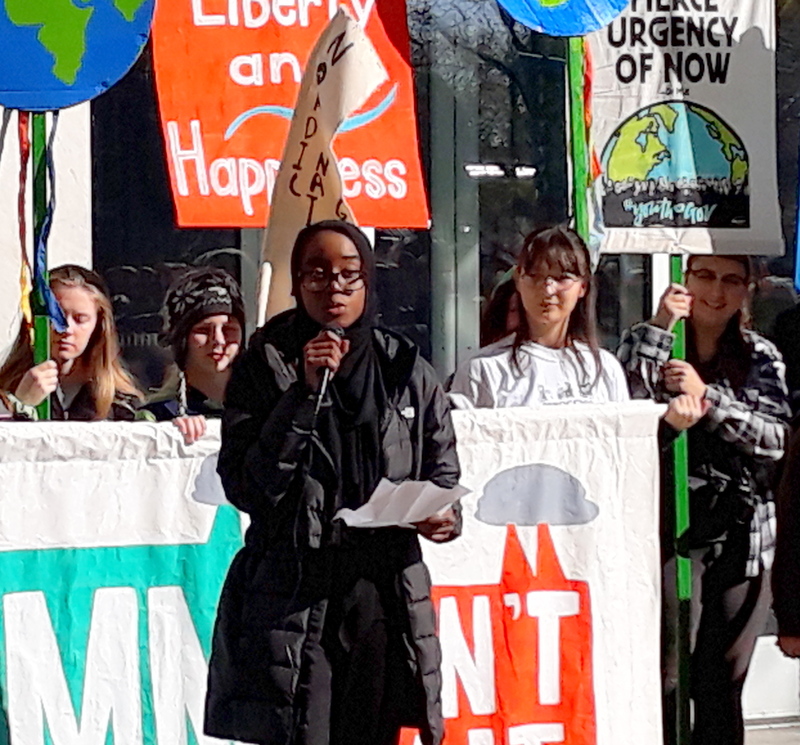 In yet another action, a group of 11 youth called Student Climate Petitioners submitted a petition to the Minnesota Pollution Control Agency (MPCA) asking it to adopt new rules regulating greenhouse gases. (The Minnesota Center for Environmental Advocacy represents the youth petitioners.) The petition said that Minnesota established goals to reduce greenhouse gas emissions in its Next Generation Energy Act but is going to fall short of those goals without stronger actions. The petition lays out guidelines for the rule-making process. However, with just a few months remaining until a new administration takes office, now is not the time to begin such an intensive initiative . Shaza Hussein, 17, a senior at Rosemount High School, is one of the 11 Student Climate Petitioners. She is also a youth leader with Climate Generation. She spoke Sunday about the climate change impacts on her relatives in Sudan. A lot of my extended family is concentrated in north Sudan and many of them are farmers. My grandpa had a huge farm with lots of acres and I have watched his ability to farm decline over the years because of intensification of weather. My motherland is at risk of becoming uninhabitable due to climate change. See her full speech on Facebook here. Hussein also belongs to a youth group called Minnesota Can’t Wait, and here is the group’s petition on climate change. Please consider signing. Also speaking was Nolan Berglund, 17, an enrolled in the Northern Cheyenne Nation and also Oglala Lakota. Berglund is a member of the Youth Climate Intervenors working to stop Line 3. All the pipelines will be affecting our future and affecting the indigenous communities specifically — my community. 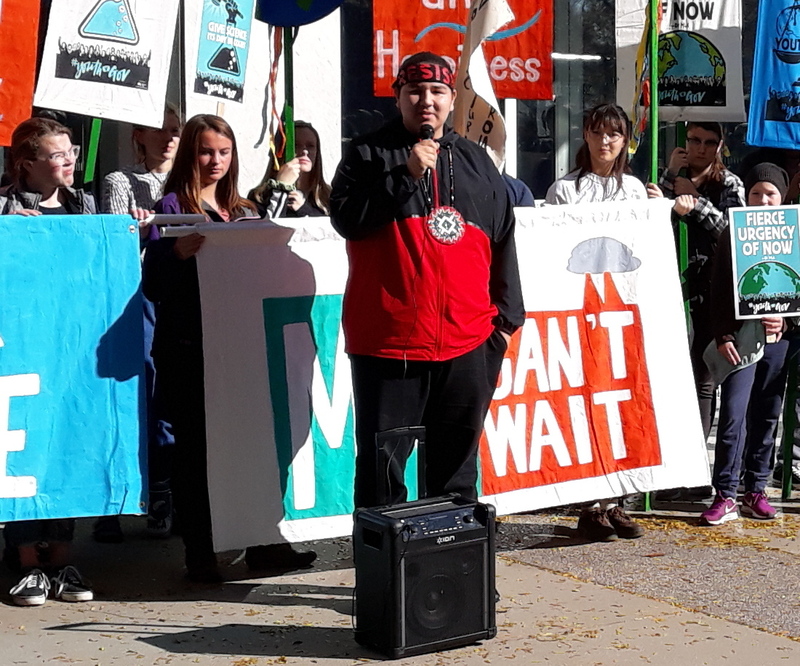 … I am here to use my voice to let the Minnesota government and the Minnesota state know that we will not sit down while our lands and our waters are being contaminated with oil and polluted. I want to apologize. I don’t know all of the data, I don’t know all of the numbers when it comes to how it would be affecting us. But I know my story. I know what I care for. I care about my nieces and nephews. I care about my grandchildren that are not here. I want them to have a future where they can look arouind this world and see the beauty that I was able to see. And they are able to breath the clean air and drink the clean water. That is their human right. See his full speech here. 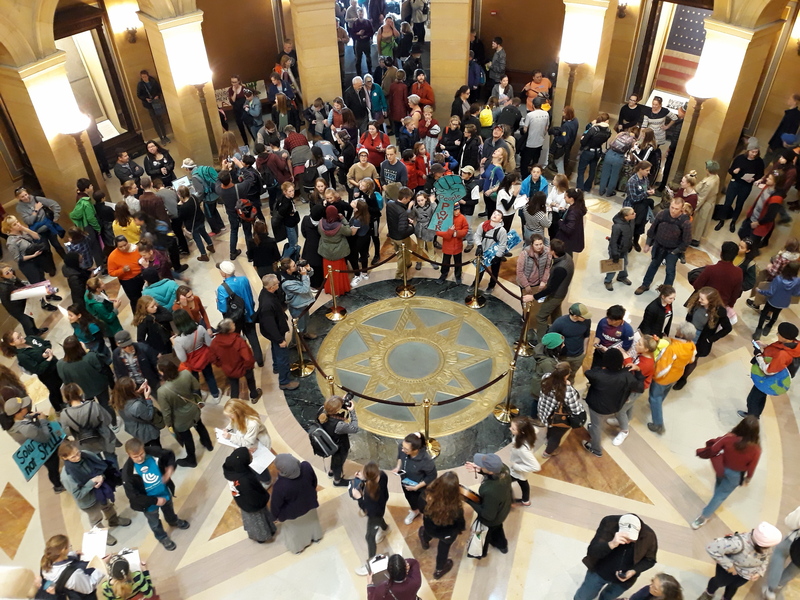 In addition to the Youth Climate Intervenors, march and rally sponsors included: Youth Environmental Activists of Minnesota; Sunrise Movement, Twin Cities; Minnesota Can’t Wait; Our Children’s Trust; iMatter Youth; and the Powershift Network.